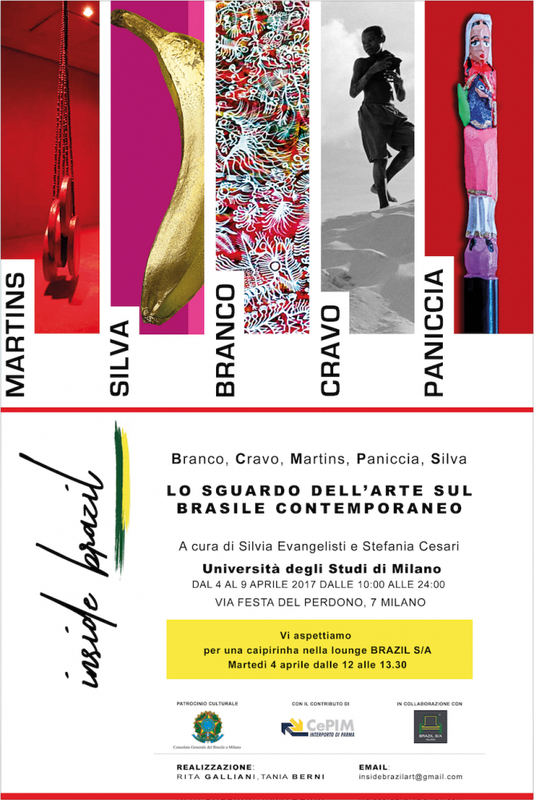 We will be waiting for you at the exhibition Inside Brazil curated by Stefania Cesari and Silvia Evangelisti which will be held from 4 to 9 April at the University of Studies in Milan Via Festa del Perdonos, 7 every day from 10 to midnight ! Press Release: On the occasion of the fuorisalone 2017, the university of studies in Milan will host the exhibition Inside Brazil from 4 to 9 April, it will be featured into the context of material/ immaterial, design making it emerge the more contemporary Brazilian soul in the heart of the most attractive avant-garde design. The exhibition, with the cultural patronage of the Brazilian Consulate in Milan, will be part of Brasil S/A, the most important event of Brazilian design, which comes to life every year during the 'salone del mobile' in Milan. Inside Brazil will have a special corner dedicated to contemporary art from Brazil, showing inside the cloisters of the renaissance works of some Brazilian Artists: Branco, Christian Cravo, Luiz Martins, Monica Silva and Valeria Paniccia.